According to Susan Deller Ross, many human rights advocates still do not see women's rights as human rights. Yet women in many countries suffer from laws, practices, customs, and cultural and religious norms that consign them to a deeply inferior status. Advocates might conceive of human rights as involving torture, extrajudicial killings, or cruel and degrading treatment-all clearly in violation of international human rights-and think those issues irrelevant to women. Yet is female genital mutilation, practiced on millions of young girls and even infants, not a gross violation of human rights? When a family decides to murder a daughter in the name of "honor," is that not an extrajudicial killing? When a husband rapes or savagely beats his wife, knowing the legal authorities will take no action on her behalf, is that not cruel and degrading treatment? Women's Human Rights is the first human rights casebook to focus specifically on women's human rights. Rich with interdisciplinary material, the book advances the study of the deprivation and violence women suffer due to discriminatory laws, religions, and customs that deny them their most fundamental freedoms. It also provides present and future lawyers the legal tools for change, demonstrating how human rights treaties can be used to obtain new laws and court decisions that protect women against discrimination with respect to employment, land ownership, inheritance, subordination in marriage, domestic violence, female genital mutilation, polygamy, child marriage, and the denial of reproductive rights. Ross examines international and regional human rights treaties in depth, including treaty language and the jurisprudence and general interpretive guidelines developed by human rights bodies. 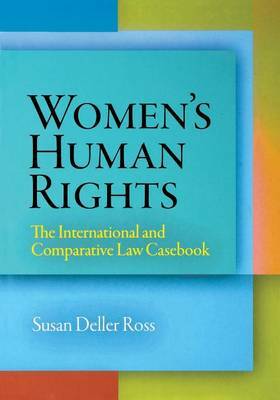 By studying how international human rights law has been and can be implemented at the domestic level through local courts and legislatures, readers will understand how to call upon these newly articulated human rights to help bring about legislation, court decisions, and executive action that protect women from human rights violations.